Contemporary, neo-classical solo piano gems, sparkling with elegance and joy. Kelly’s 2015 release, "Butterfly Rapture," won and was nominated for several awards and is currently nominated for Best Solo Piano Album in the 2018 Enlightened Piano Radio Awards to be presented in Berlin in October 2018. Kelly’s first album, "Pools of Light," was released in 2004 and was named “One of the Best Albums of the Decade” by this reviewer. "Tomorrow’s Daydream" opens with the title track, a piece that starts out at a leisurely pace and gradually becomes livelier while maintaining a relaxed feeling. The energetic “Tracing Rainbows” expresses a magical excitement wrapped in swirling colors and joyful exuberance - a favorite! “Dancing With the Moon” begins with a Baroque-sounding intro that becomes beautifully delicate and almost fragile, gradually building to an expressive peak before returning to the softer theme. Near the end of the piece, Kelly inserts a passage that sounds almost like a harp - wow! “Our Own Window” is smooth jazz with a slight edge - cool, relaxed and very graceful. “Daffodil Hill” is another favorite with its joie de vivre spirit and carefree innocence. I feel exactly like this when the daffodils start opening in the early spring and a whole hill covered with them is almost euphoric! “Meant to Fly” takes a poignant, bittersweet turn that is as beautiful as it is emotional - another favorite. “Iris Blue” makes me think of dancers in filmy blue dresses gracefully welcoming the promise of spring - I really like this one, too! “Journey Home” begins with a simple melody that seems to have its soulful roots in gospel music, gradually building more complexity and then returning to the simplicity of the opening passage. “All of Thee Above” has a gentle, uplifting energy that is unhurried and free. The spirited “Secret Look” overflows with unbridled happiness - also a favorite. “Before You Go” closes the album in a more classical style that is both elegant and emotionally powerful - a fitting end to a great album. 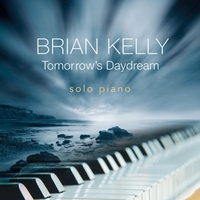 "Tomorrow’s Daydream" is excellent from the first note to the last and I hope it will bring Brian Kelly the attention he and his music so richly deserve. Very highly recommended!